Hi folks, and welcome to the latest issue of the Bioscope’s erratically published but lovingly composed newsreel, mopping up for you some of the more diverting news stories of the week on silent film. A few weeks we published a post on Brides of Sulu, a supposedly American film from the mid-1930s which probably took footage from an Philippine silent fiction film (possibly two) and added an American commentary. All Philippine silent film production was believed to be lost, so this is an exciting discovery, and it was naturally a highlight at Manila’s recent International Silent Film Festival. If you read comments to the original Bioscope post you can find extra information from the grandson of the film’s lead actor, ‘Eduardo de Castro’ (real name Marvin Gardner). Or there’s an informative piece in the Philippine Daily Inquirer on the research involved – though I think the director was not the Philippine José Nepomuceno but rather American silent film veteran Jack Nelson. But the journalist has read the Bioscope, which is grand. Read more. A feature film adaptation of David Yallop’s account of the Fatty Arbuckle case, The Day the Laughter Stopped, is in development. The film is scheduled to star Eric Stonestreet and will be a telefilm made for HBO. Will silent cinema’s pre-eminent tragic tale make a successful transference to the screen? With Barry Levinson as director, we must hope at least for a thoughtful interpretation. Read more. 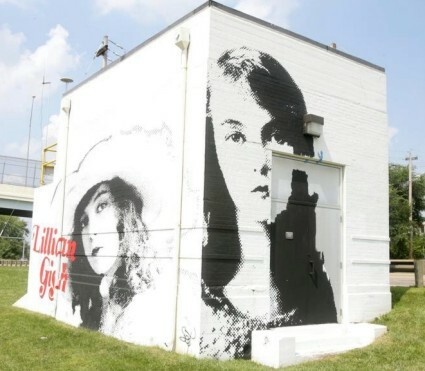 Massillon, Ohio artist Scot Phillips has created a mural featuring Lillian Gish at the junction between Lillian Gish Boulevard and Route 21, unromantically painted on a west-facing wall of a pump station next to the Tuscarawas River. The silent film star grew up in Massillon, hence the mural and the road. It took him all summer. Read more. What are the two most discussed silent films of 2011? They must be Michel Hazanavicius’ modern silent The Artist, and the colour restoration of George Méliès’ A Trip to the Moon. So hats off to the Telluride Film Festival for bringing the two together in one of the more imaginative programming coups of the year. And they are playing at the Abel Gance Open Air Cinema … Read more. Mark Cousins’ book The Story of Film (2006) is a pretty good and impressively wide-ranging generally history of the medium. It’s now been turned into a 15-part television series showing in the UK on Channel 4’s offshoot channel More4 from tomorrow. Expect to see silent films given their fair due (says the press release of episode one, “Filmed in the buildings where the first movies were made, it shows that ideas and passion have always driven film, more than money and marketing”). What you don’t expect to see is a UK television channel go so far as to show a silent film itself, but – incredible to relate – Film4 is showing Orphans of the Storm on 6 September to accompany the Cousins series. Read more. Re Brides of Sulu: maybe José Nepomuceno=Jack Nelson. I hear that an equally significant Philippine film has been found: ‘Native life in the Philippines’, the work of American administrator in the PI, Dean Worcester. Maybe these films will be shown at a festival somewhere? Well, at the Manila International Silent film Festival for starters, though I hope the people at Pordenone have been taking note of all this Philippine business. Where has Native Life in the Philippines been found? Dean Worcester was Secy of the Interior in the PI and like many Americans there at the time was convinced that the islands needed foreign (i.e. US) help. That’s why he tried to present the most ‘primitive’ Filipinos and then show them a few years later when they’d been educated in the way of the Yanks. He was actually quite a smart fellow, and his book “The Philippines, past and present” is packed with statistics and facts. But he just couldn’t get over his prejudice about the primitive Filipinos (actually the islands were the most developed part of SE Asia when the Americans took them over from the Spanish). Worcester is not such a popular guy among the modern Filipinos, and I noticed that the version of his book on the Internet Archive from U California has been defaced to change his name to ‘ignorant’ or ‘ingrato’. Unlikely that Pordenone would show this film given that it’s (a) not from Russia (b) non-fiction. This merits a separate post of some kind. Well spotted! I hadn’t noticed that the film was online — at the wonderful Internet Archive. However, this looks like rushes (one can see camera stoppages between takes), and I have an idea from talking to Nick that a version with titles has come to light. Maybe I misunderstood. A version with titles would probably have far more of a ‘charge’ in that it would give us Worcester’s POV. Or maybe there was a lecture script? (possibly it would survive among the Worcester papers in Michigan University). Probably more will be revealed about Mr W when Nick’s next book is published — on the American influence in Philippine cinema.